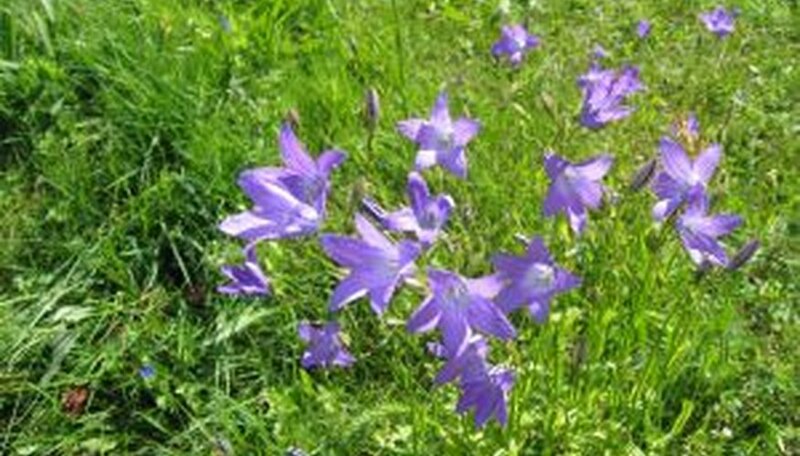 Perennial bellflowers, or campanula, come in many varieties but all are prized for their bell-shaped blue or white flowers. These hardy flowers grow well in alpine areas, rock gardens, borders or as bedding plants. They survive through the first light frosts of autumn with blooms intact and do not fade until after a hard frost. While they will survive with little maintenance during the winter, taking some time to prepare them ensures they will weather the winter season with minimal chance of disease and damage. Allow the foliage to yellow and die back naturally, usually shortly after the first hard frost of fall. Avoid cutting back the bellflowers while they are still green. Cut down the dead foliage with sharp garden shears. Dispose of it if there have been any disease or insect problems during the summer; otherwise composting is fine. Remove leaves, twigs, vegetation and all other garden debris that has collected or blown into the bellflower bed. Dispose of or compost the vegetation. Remove any old mulch from the bed if applicable, since it could harbor insect eggs or disease. Add a fresh 1-inch layer of compost on top the bed to add nutrients to the soil. Use a liquid fertilizer for rock gardens that don't lend themselves to composting. Apply a 2-inch layer of straw mulch over the beds to prevent winter weed seeding and to help maintain ground temperature to prevent frost heave. Remove in spring before the bellflowers begin growing. Deadheading, or removing spent blooms, will ensure lush summer flowering. Leave a few spent flowers in place to reseed the bellflowers in autumn. Use evergreen boughs instead of straw.